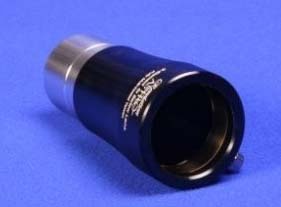 Revelation Astro 5x Barlow Lens 1.25"
A 1.25" high quality 5x three element apochromatic Barlow lens ideal for imaging applications. Fully multi coated optics with air spaced design optics. This model is designed to compete with much higher priced units with superb optics and construction at a remarkable price. With apochromatic optics this Barlow offers far better colour correction and contrast than is possible with normal two element designs. An ideal design for use with short focal length telescopes to enhance planetary imaging with video or web cam imaging systems.